The presses at Univocal have caught fire lately. This first English translation (thanks to Randolph Burks) of a major work of Michel Serres, the Biogea, thunders with the authors’ fierce ingenuity and glows with his gentle wisdom. Michel Serres always versifies, but in the rhapsodic Biogea, this spontaneous musicality becomes symphonic: stories and theories slowly develop their singular contours in high-tension counterpoint. Fabulations and memories pass into theories and critique; celestial and rapturous encomia to the Biogea flow from the most severe of warnings about a biosphere on the verge of irreversible catastrophe. The essence of the work is profoundly multiple; the Biogea hums and resonates with both intimate and radically alien languages. In prose that openly fabulates and mythologizes, Serres gives immersive voice to a series of critical memories — cautiously re-entering the serpentine fluidity of the waters of his youth on the sea or rehearsing a terrible symphony of wind, wolves and human cries on a dangerous trek up Mount Everest — enveloping these delicate arias within elegant theoretical formulae. 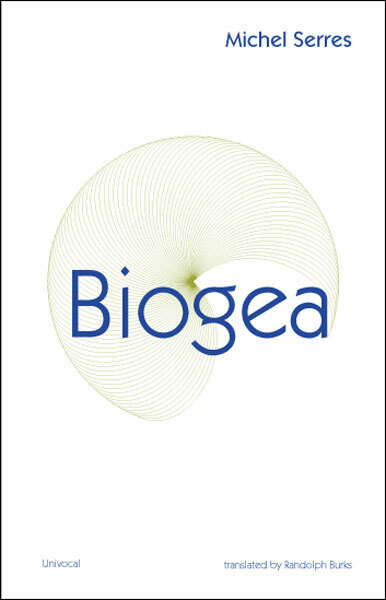 Biogea is an animated, joyous, spiritual work; a new sculpture of Venus rising from chaotic seas. Serres becomes a many-tongued artist of pure mutation; our Joyce, prophet of fire for the hypertext era, here close in spirit to Deleuze. Artaud said the violent blows of Van Gogh’s brush knocked even rivers off their course; suffice perhaps to say the joyous ellipses traced in this work could not help but shift time, life, the world around us from their former trajectory. Biogea is joy: hence a future and untimely book, even a dangerous book, written in vigorous defiance of a melancholy history. The text is highly recommended to readers of Serres, who will undoubtedly luxuriate in the glowing pages of this powerful and delicate work. For those not yet familiar with Michel Serres, it may serve as a whirlwind introduction to the most urgent themes in his later work; and since to some degree it also provides a personal-critical intellectual history of the author, it might even be recommended before other major works such as the Parasite or Troubadour of Knowledge.